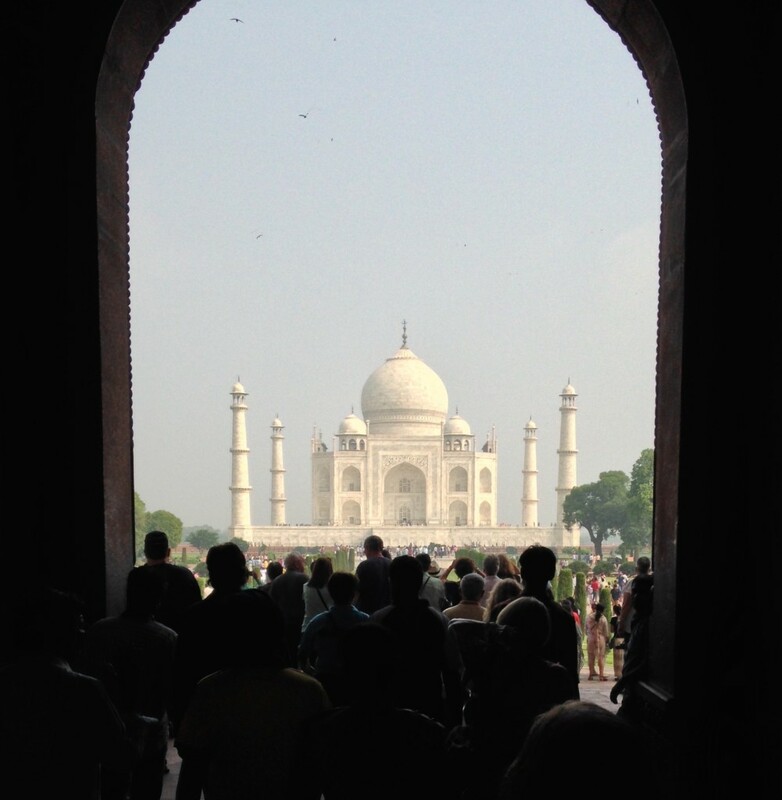 The approach to the Taj Mahal is meticulously orchestrated. We felt the architect’s sense of drama from the moment we saw the complex of buildings. The grounds outside the outer gates are immaculately kept and hint of the beauty to come. Anna made sure that we were the first visitors to arrive for the day and that we had tickets before we arrived so that we didn’t have to stand in a queue. I’ll always remember the entrance to the site, how the view unfolded layer by layer, how we saw the Taj Mahal through a keyhole opening that exactly framed it, as though it were a miniature painting, before we finally entered the open space of pools and lawns surrounding the structure. I had seen pictures of the Taj Mahal my whole life and expected it to be splendid and deservedly beloved by the citizens of India. But I was not prepared for the beauty of the mausoleum. 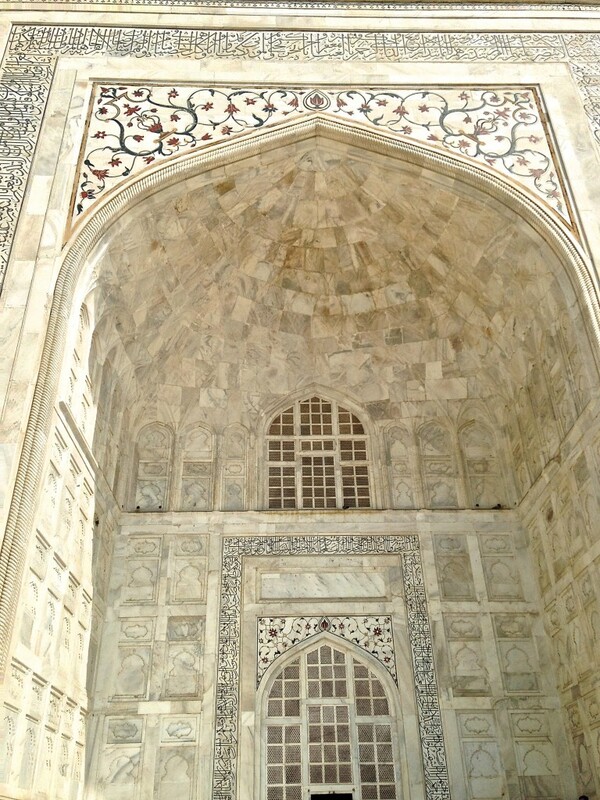 As we approached the edifice, it was even more elegant on closer inspection when we could examine the intricate inlay of semiprecious stones in the fine white marble. I can’t think of another building in the world quite as exquisite. None of the decoration on the walls is painted. All of the pattern and color is done with semi-precious stones that are cut to the desired shape. Then that shape is ground out of the marble and the stone is inlaid with a special glue that has proven strong over the ages. 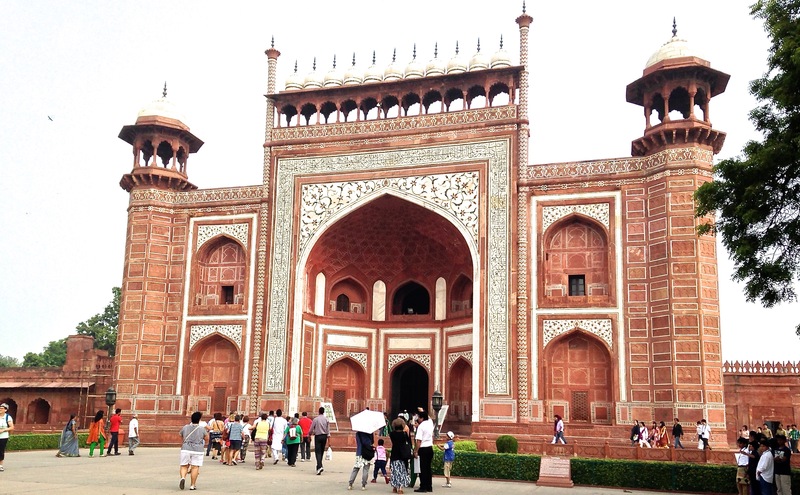 The Taj Mahal is considered the finest example of Mughal architecture in the world. 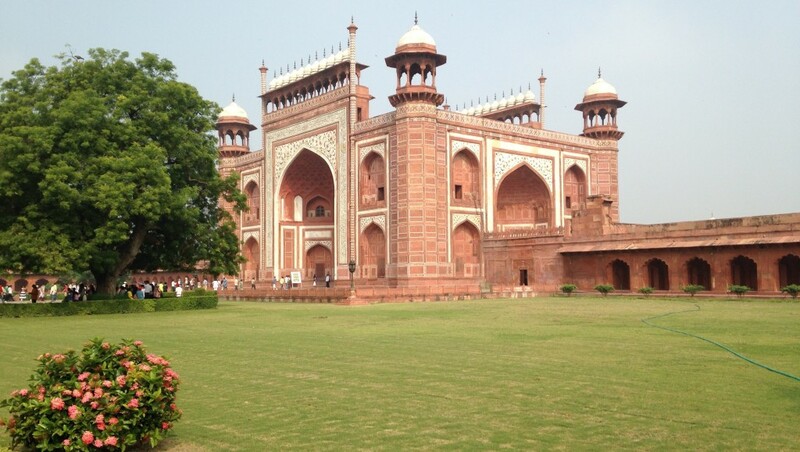 The mausoleum was built by Emperor Shah Jahan as a mausoleum for his beloved queen. Across the river he intended for an antithetical structure in black stone to be built for his own mausoleum. But his son (rightly) thought the building program would bankrupt the country, and when he could see his father had become incapacitated by grief and unable to rule, the son imprisoned his father in the Agra Fort. Given his choice, the deposed ruler preferred rooms overlooking the Taj Mahal so that he could be near his beloved for the remainder of his days. Ah, yes . . . the romance of India . . . it’s all true. I wanted to stay where such beauty existed; I hated to leave. But it helped to know how dearly the Indians treasure the site. 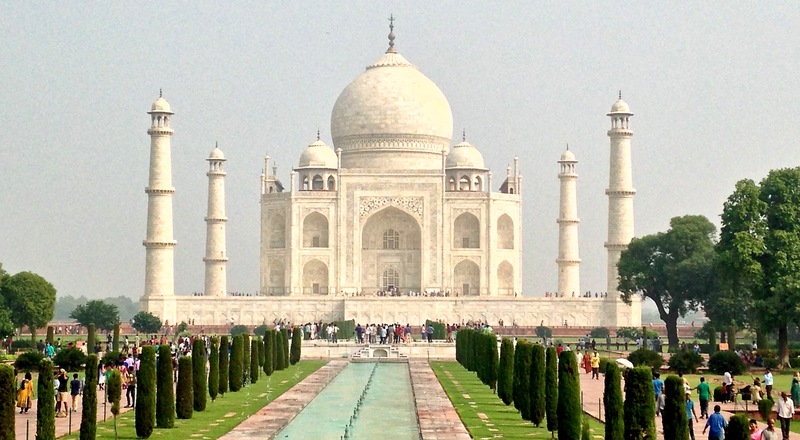 In fact, the Agra city leaders have banned any commercial enterprises within specific distances of the site if they might emit pollution that could harm the marble of the Taj Mahal. 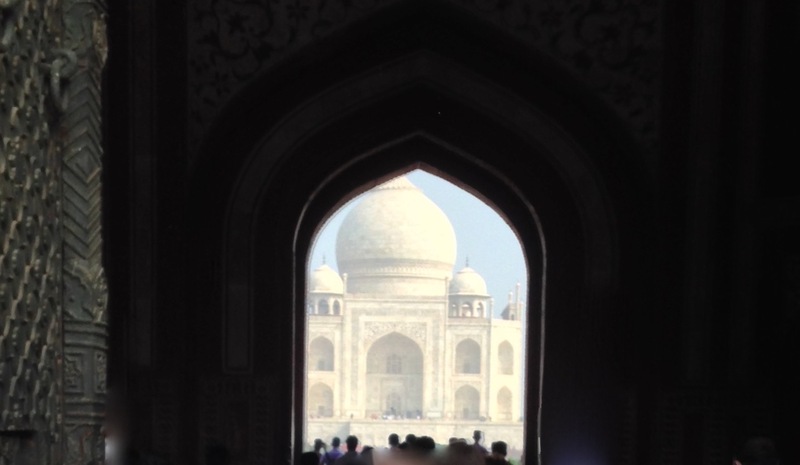 I took comfort in the likelihood that the Taj Mahal will remain in place and unspoiled for many more centuries.